Have a wonderful weekend and don’t let work sneak up on you! Sneaker by Elizabeth Perry. 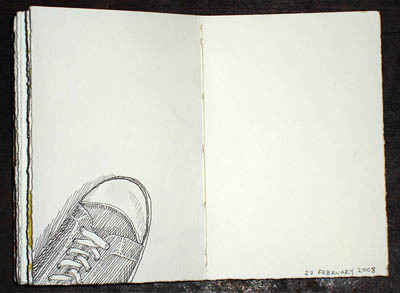 Daily drawings and paintings in a small sketchbook celebrate and record everyday life in this blog by Elizabeth Perry. In the future there will be an interview with Elizabeth on how she engages with her art and possible implication or applications to work engagement.